The building sits empty and the wind blows through the broken windows but if you use your imagination you can almost hear the pounding of a hammer as it shapes an iron rim to fit a wagon. Bergen's Blacksmith shop was established by John Bergen in 1905, just three years after his emigration from Russia. John's grandson, Ben, continued to work in the blacksmith shop until his health began to fail him in the early 1990s. 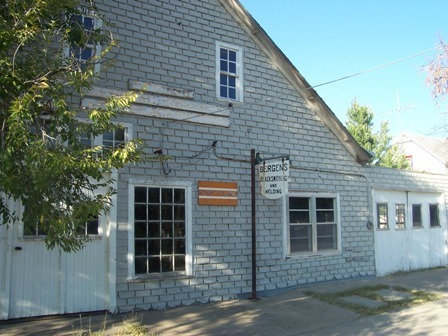 Items from the Blacksmith Shop were donated to the Mennonite Heritage and Agricultural Museum located at 200 N. Poplar, along with photos. Museum hours are May-September Tuesday-Friday 10 a.m.-5 p.m.; Saturday-Sunday 1-5 p.m.; May-September Tuesday-Friday 12-4 p.m.; March, April, October-December Saturday-Sunday 1-4 p.m. The building is privately owned and not accessible to the public but you can stroll down the sidewalk in front of the building.